Every once in a while I’ll come across an interesting new beer related product and want to test it out for the blog. This Christmas I discovered that Santa had brought a little box of Beer Stones! So here goes! 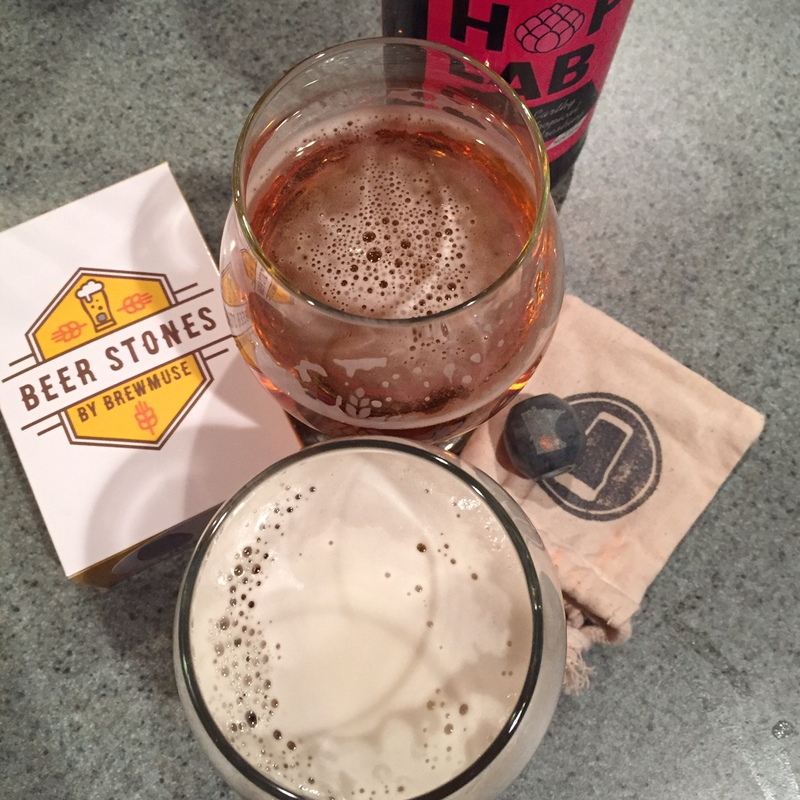 I had never heard of Beer Stones prior to discovering them peeking out of my stocking. To me, beer stone is that calcium based deposit that I struggle to keep out of my tap lines! Opening the box I discovered a cute little cloth bag with two olive shaped polished soapstone ovoids. 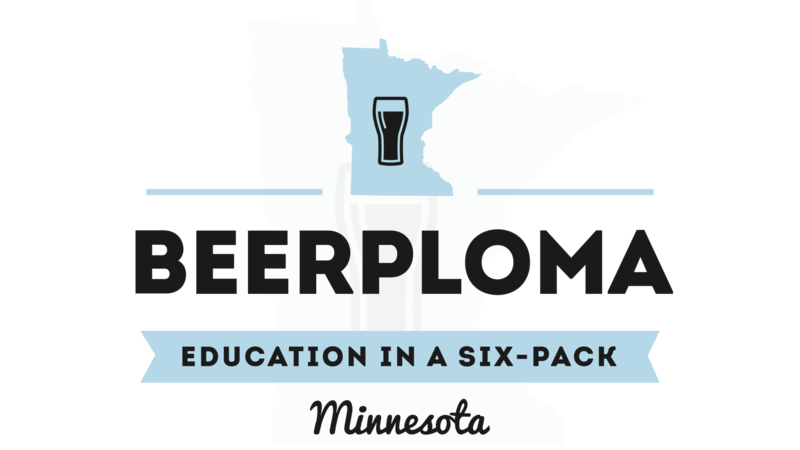 One had a little Minnesota state and the other had a hop cone pattern engraved upon their shiny surfaces. So far so good, but what were these things? 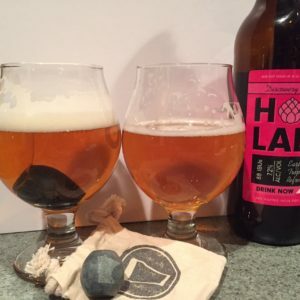 Created by Bryce Bunkers, a self-proclaimed beer lover (and mechanical engineer), Beer Stones were made to change or enhance the carbonation levels of beer in the glass. These are a Minnesota product so I was all the more willing to give them a try. Lets get sciency for a minute! Most beers are carbonated with CO2, either naturally occurring with fermentation in the bottle or injected with CO2 prior to kegging. The carbonation level significantly changes the flavor, mouthfeel, and foamy head of your beer. Every have a flat beer? Yech, it seems lifeless, the flavor is muted, and it just doesn’t taste right. However, not all beer styles use the same carbonation level: British ESB tends to be lower on carbonation. Belgian ales tend to be highly carbonated and effervescent. Then there’s Cask beer. Originating in the British Isles, cask beer is traditionally naturally carbonated in a small wooden cask (or Firkin) and often has a lower carbonation level and creamier mouthfeel than typical bottled or tap beers. You may also see Nitro taps around that use a mix of gasses including about 70% nitrogen and 30% CO2. Nitro taps really started as people were trying to get a similar mouthfeel to cask beers without all the hassle of messing around with casks, and hence results in a creamier body and usually a finer, larger head on the poured beer. Now that you’ve had your basic carbonation primer we can talk about what Beer Stones actually do. They are meant to be placed into your beer glass and then beer poured over them. 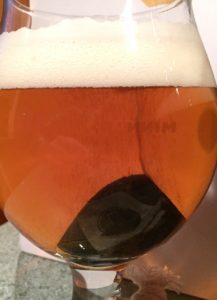 The idea is that the etched design on the stone becomes a nucleation site–resulting in more bubbles rising from the beer and a larger head on the beer. I have a few Belgian beer glasses (such as Duvel) that have a small design etched into the bottom of the glass to do the same thing. Also, you can keep them cold and they will add a little more time before your beer warms up–never a bad thing for a warm summer day. So, first off–does this really work? Time for a side by side! I was too lazy to set up my tripod and real camera on the fly so I used my iPhone…laziness wins! I wanted a lighter colored beer for my first trial so used a bottle of Bank Brewing’s wonderful Hop Lab Pink IPA. I used the same style and size of glass and poured the same amount of beer in each to try to keep down all the other variables. The result visually was notable almost instantaneously: The bubbles came streaming up off the etched surface of the Beer Stone. Within a minute or two the head of the Beer Stone glass was significantly higher, as well as tighter and more like what you would see with a nitro beer. Over time, the head of the control glass dropped down (but not gone) within about 5-10 minutes. The Beer Stone glass continued to have a much larger and thicker head, even to 15 minutes out. So visually, the effect was significant and aesthetically pleasing. How about aroma? I was using a citrusy hop monster of a beer here, so it had plenty of fruity aroma going on. The control beer smelled wonderfully like a tropical fruit medly. The Beer Stone glass actually had a slight drop in sharp hop aroma and seemed more mellow–but not a huge difference. This surprised me bit since I imagined the increased carbonation and foam would have lifted more aroma out of the beer and into the air at the top of the glass. Huh. But how did it taste? First off, I really like this beer as it hits my sweet spot between sweeter tropical fruit IPA and bitter citrus rind. The control beer tastes just like normal (no shock there). The Beer Stone version has a significant change in body and mouthfeel which affects the overall sensation and flavor of drinking the beer. I got a much smoother, less bitter sip out of this version. Tropical fruit was increased while the bitterness dropped. It tasted more like an English cask IPA that had been dry hopped with Mosaic hops. This was not a bad thing, but a very different effect. Realizing that the effect of the Beer Stone was akin to having a nitro or cask beer, I decided to try this out on a stout, since that would be an appropriate beer for cask. I used the fairly strong and bitter Bell’s Expedition Stout for this experiment and it worked just like I had imagined: a thicker creamier head and smoother mouthfeel. 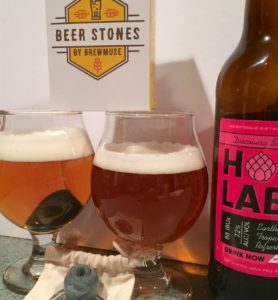 So are Beer Stones worth it? I’d say it depends on what you are looking for out of your beer. One the one hand, you may change your favorite beer to a point where you may not like it as much. On the other, you may be able to tweak a beer that isn’t quite to your taste into something different! I’m not going to use these for all of my beers at home, but say I open a new IPA and it’s too astringent and harsh…maybe I’ll throw in a Beer Stone and see if I can mellow that out a bit. Also, this is a great way to approximate the effect of a cask or nitro beer without investing hundreds of dollars in specialized equipment! Beer Stones can be bought on-line directly from them HERE, or at various Minnesota stores such as Waconia’s Unearthed Arts. The cost listed online is $28 for two and come in three different designs.